« To come from another mountain, » the pseudonym that Qiu Jie likes to use not only to sign his work but also to define himself is an ironic play on words. The litteral translation is « the man who comes from other mountains » (ta-xiang shan-ren). It emphasizes his continual negotiation between memories, nostalgia, imagination and reality. It is a name that evokes the freedom of his nature, the roughness of his childhood during the Cultural Revolution and the intersecting paths of his destiny in China and Switzerland. 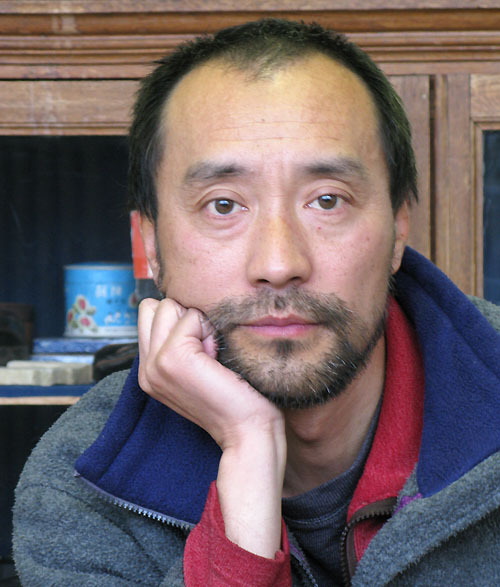 Born in Shanghai in 1961, Qiu Jie was raised by his grandparents while his parents were relocated in a village in the Anhui province during the Cultural Revolution. At age 10, he started to learn how to draw by copying propaganda images that he found in local newspapers. 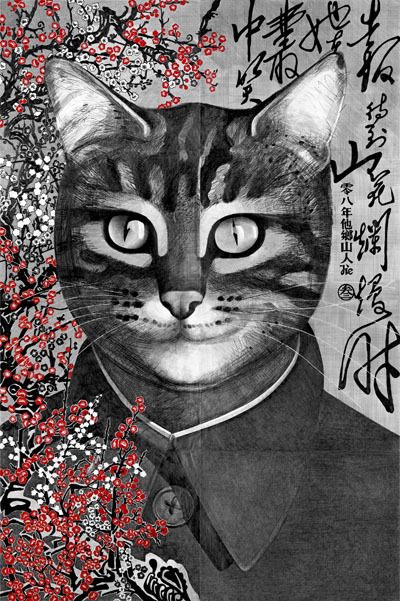 In 1978, two years after Mao’s death, he was admitted in the Art Department of the Shanghai Light Industry College. There, he received a strong education in realism that would imprint his future work. The teaching of abstract art was still non-existent. 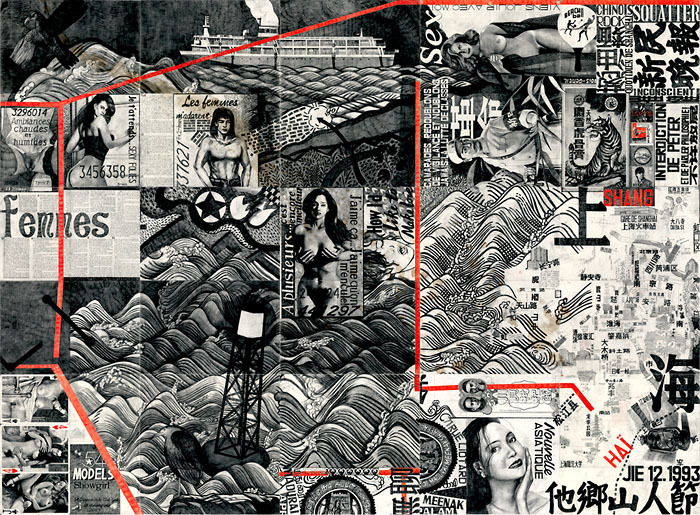 At the time, attending an art school in China might have seemed a strange choice, since there was no way for an independent artist to live from his or her art. But, there were jobs for this post-Cultural Revolution student generation. Qiu Jie was hired as a decorator in a state company representing 50 differents factories that were producing electrical appliances and precision machinery. For six years, the job gave him the opportunity to travel within China to prepare shows and fairs, and to meet foreigners who were beginning to commission work in China. Qiu Jie occupies an unusual place in the contemporary art world. No splash of vivid colors, no use of mixed media, no display of shocking or obscene material, no violent confrontation. Instead, the modest use of pencil and paper. Black and white and all the subdued tonalities of grays are his palette. 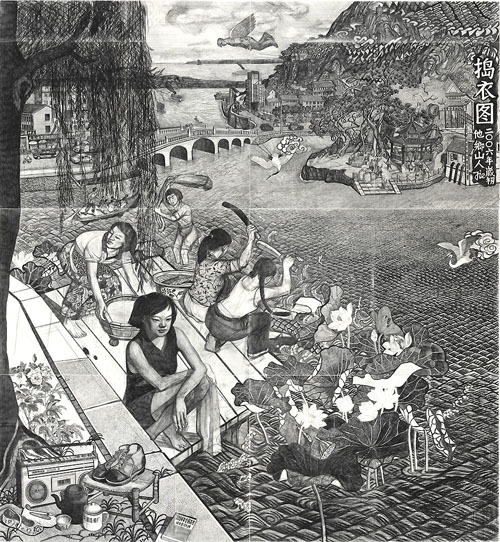 But, if most artists use drawing as a preliminary preparation, Qiu Jie uses it as a finality. Qiu Jie’s drawings reflect on society today. And he does this in a monumental way not only in terms of size but also narratively. In the beginning, the complex harmony of his work took him by surprise. For his first solo exhibition in Geneva in 1993, his 16-square-meter studio was too small to do an entire composition at once. He drew parts of it on different pieces of paper. Each one was a fragment of the composition, which, once installed in the gallery, became a 28-square-meter drawing whose lines and subjects fell into place in an unexpectedly pleasing way. Qiu Jie’s impressions about his early days in Switzerland are mixed. On his arrival in Geneva, he was burdened with debts. For five years, he worked at MacDonalds while studying at the Geneva Art Academy of Fine Arts. He remembers the harshness of that period. « You know that it won’t be easy when you arrive in another country. But, the material difficulty was very real, heavy. I felt alone. I had debts when I arrived. Today, Chinese students have parents with money. Me, I came with empty pockets. I still remember what the teller at the Swiss bank told me at the end of each month…’this month you have 1.20 Swiss francs (more or less $1.50) left on your account !’ » But, the Swiss cultural system is also known for being very dynamic and generous towards young artists just out of school. Qiu Jie received several grants that made possible his daily life. He thought naïvely that his path was secured because, as a Chinese, he was offering something new, something fresh with his drawings to the local art scene. Reality hit him a few years later when he realized that the grants were going to younger artists. He had to rely on himself ; the system that supported him once, now forced him to fly with his own wings. But now, he knew how the system worked and he had acquired personnel tools and new strength to push him forward. In 2005, he decided to try his luck in China, the homeland he had left because there were hardly any opportunities for artists at the time. He found China open to the rest of the world. He had grown as well. A difficult life had given him a larger vision. He could look at the future, at his future. But, he decided he needed time to create. One of his drawings could take up to a year. China was moving too fast. Collectors put pressure on him to go even faster. He decided to continue to producing art in his studio in Geneva. Qiu Jie likes to play with juxtapositions. It is his way to weave different times and cultures together along an invisible line. This line allows us at the same time to follow the story and to be lost in translation because we travel in the rtist’s mind across boundaries. Qiu Jie creates an unsettled atmosphere. There is a today that almost happened yesterday or could become our tomorrow. This is a vision of a global world in which our codes of reference change constantly. To use Qiu Jie’s simple metaphore : « Today, I can eat some spaghetti, tomorrow some green salad. In my studio, I speak French ; at home, Chinese. » We live as charged and uncontrollable neutrons. The stories of the world sweep through us via the media. How can we connect in only three minutes the Tsunami in Japan and rebels in Lybia except through images ? And what could finally be the impact of these images on our reality and on our imaginary world ? How do we synchronize our current life and our memories ? 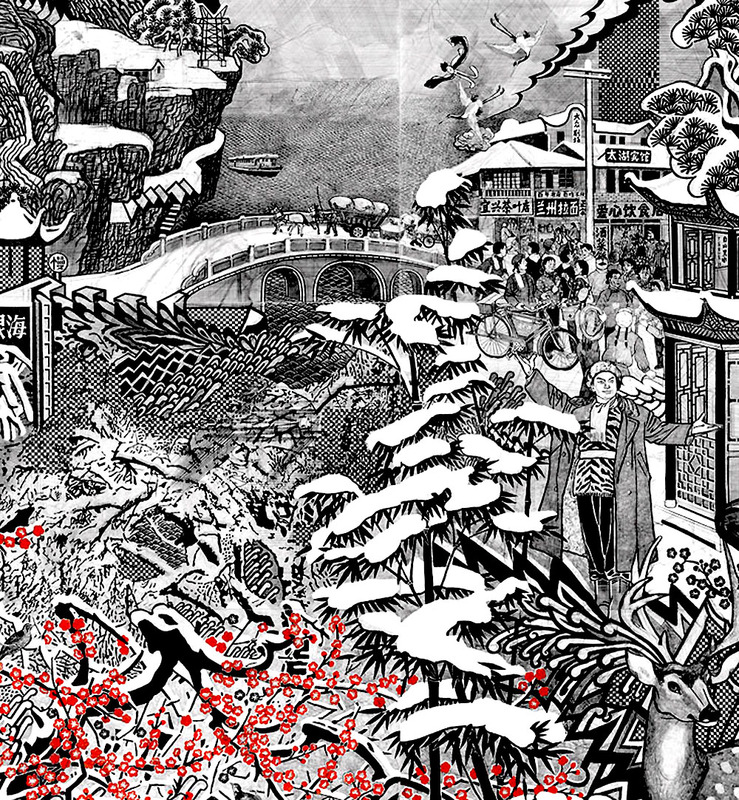 Memories from childhood are strong but not primordial in Qiu Jie’s art. He takes inspiration everywhere. Evidently, his memories from China play a role. The fact that he left his country strengthened his memory. But, he looks for inspiration everywhere else and he meticulously documents what he finds with careful research. An ad in a train, a photo in a magazine, an image from a movie…constantly his attention catches the interesting pose, the provocative smile, the controversial anecdote, the beauty of a flower… all elements that would find an improbable connection in real life. In Never say Never Again (1996), Sean Connery, as Agent 007, points his gun at us and declares, « Jamais Plus Jamais » (never, never again). Next to him is a woman, a traditional heroine, smiling, confident, defiant even. Two worlds, united with closed fists. One inward, the other one outward. For the viewer, it is challenging to look and absorb these iconographic elements. There is an abundance of material teeming with dense ideas. Qiu Jie recognizes that this can be tiring and even oppressing. But, the moment his first dot is drawn, it is impossible to stop the source of his inspiration. One piece of information calls for another and can be repeated somewhere else in another way in the same composition. The dimensions of the paper never limits him. His pencil flies from page to page to form a composition that can be assembled to reach seven meters or more. Qiu Jie does not consider this a collage. Each paper is individual and part of a larger unity. Clearly, this humble point of departure, this grain of rice, is a point of departure for meditation. First for the artist. Later for us. To draw waves could take up to a week during which Qiu Jie only does that. His imagination seduces reality. It becomes a game between the rigor of the work and the quiescence of the mind. The themes of the world take form one after the other, but without the sound of the fury that strikes at our door. So, how does the artist go from one subject to another ? Is there any method in his composition ? 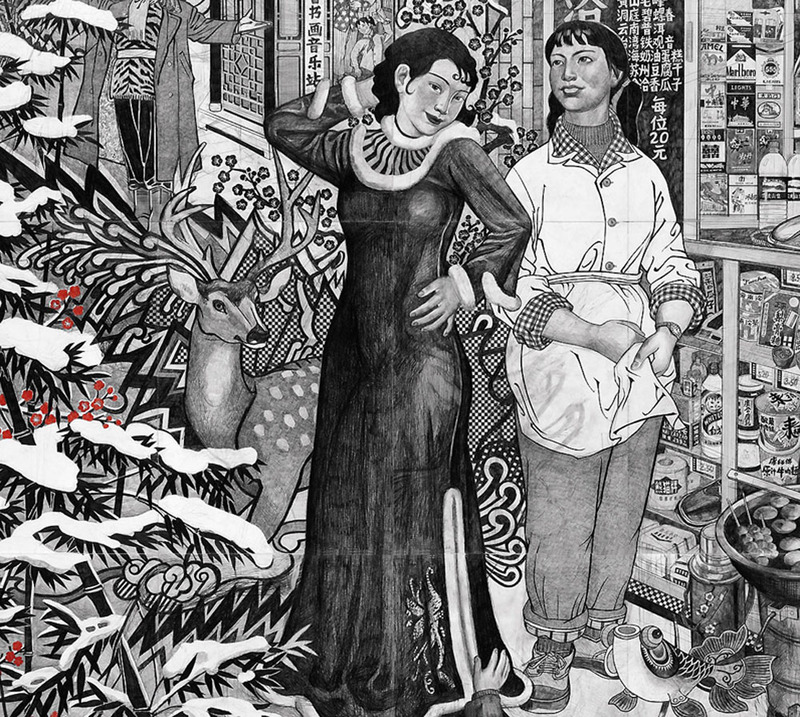 « What I am drawing is not real life, » says Qiu Jie. « I do not know if I am the one who finds the image or if it is the image that finds me ! What I do know is that when I put subjects next to each other, I create difficulty and that then I have to find a solution. There is no place for a simple subject. There are many corrections in my drawings because there are many hesitations. » It is a difficult task but not insurmountable. When asked if this process is harrowing, Qiu Jie seems confident in finding a solution, a pictorial solution. Difficulty is an integral part of art. 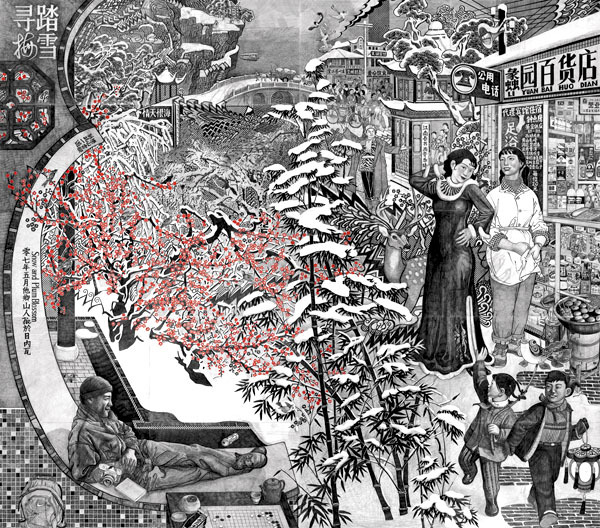 Let’s take Snow and Plum Blossom to travel inside Qiu Jie’s mental world and to follow the relationships between stories. It is like entering a virgin world made only of vast landscapes in which rivers can still take the course they want. If there is an obstacle, the force of the water forges a path through it. To draw a woman, a guitar, a forest of bamboo, anything material, requires virtuosity and assiduity, talents of which the artist is well aware. In this composition, the challenge is to render snow with a pencil, which means going further than the simple notion that snow is white. 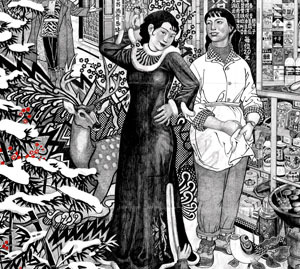 For Qiu Jie, it is also a question of telling many stories at the same time. In other words, how to start with emptiness –which is not really empty- and fill it with subjects that do not distract us from the point of departure, especially when the journey, the personnel journey of the artist, is likely to take him more than a year ? 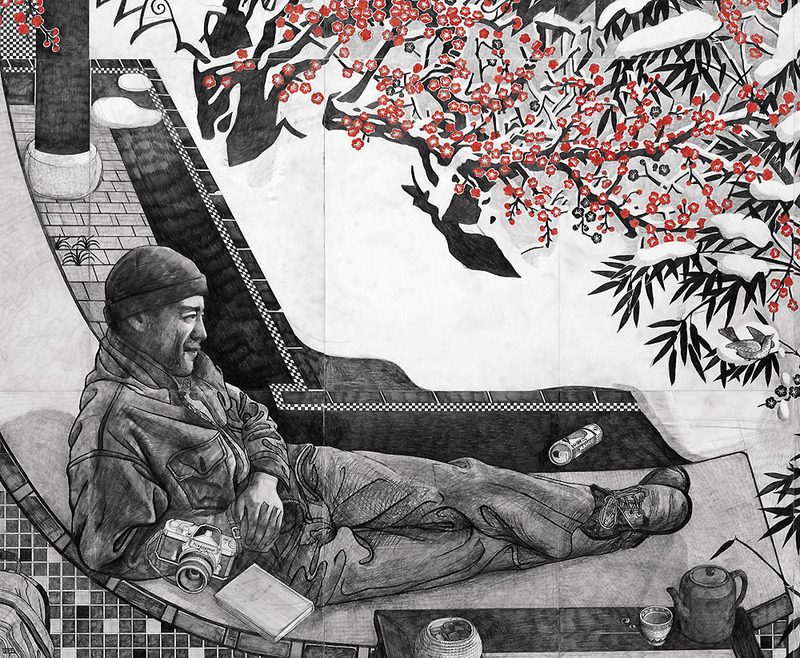 The parallel perspective helps Qiu Jie to pursue the mental drift in the emptiness of the paper. Associations between stories come little by little, step by step. It is like a novel : the artist knows the man in the composition, it is his alter ego. He knows what he thinks and how he thinks. This is the intellectual line of the story taken as a whole. The perspective gives the artist a way to take exploratory paths in order to patch the multitude of stories, which will eventually break out from the artist and lead us in our own fantasy, in the creation of our own stories. The visible face of the drawing finally encounters the invisible line of the artist’s imagination and of our dreams. There is noise in Snow and Plum Blossom. The two sisters talk to each other. The elegant one says how beautiful she is. She has stories from the city where she belongs now. The sister looks at her with admiring eyes while her two children (we may imagine that they are her children) go about their joyful and noisy games. We are in a village and nature is not fareway : a deer appears nonchalently behind the sisters while, from nowhere, springs a traditional hero, ready to sing us the song of a lost world. Birds squawk in a cold sky. The horizon has been pushed further and further away. Deliberately, because Qiu Jie needed more and more space to interlace his stories. A boat approches in the distance…maybe to take us behind the silhouettes of the mountains, far away…doubtless in another drawing. Details such as names on the shops, restaurants and tea houses ground us for a moment in the world of reality. Qiu Jie copied them from real places in China. It is a game that disorients us between dream and reality. The journey becomes real. In the rigor of the line, it is surprising to discover a funny little bird-human. This figure is present in several works of Qiu Jie. 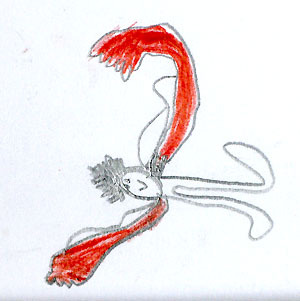 It is a touch of sentimentality since the bird-human was first drawn by his son, Sheng Mi, when he was eight years old. The bridge facilitates the connection between the noisy space full of people, shops, advertising and the contemplative world of the man thinking about the next image he will capture with his camera. He is alone, in his own sphere. He smiles, but, at the same time, he is not at ease. He can hear the noise. He feels the presence of the women, but he does not look at them directly. The obvious relationship between a man and a woman is broken, but might be present in a subtle play of seduction.